We all know that reading to our little ones is wonderful for their development. It’s one of the best things you can do when supporting your toddlers as they are learning language. (See 11 Things To Do To Support Your Toddler’s Speech & Language Development.) Some of the very best types of books to read to your toddler are ones that incorporate rhythm, rhyming, and repetition. Rhythm and rhyming tend to go hand in hand when it comes to books for littles. When sentences in a story end with rhyming words, there also is typically a predictable, rhythmic pattern to those phrases as well. When you read to your child during these early language learning years, you are naturally highlighting those patterns with your pausing, voice inflection, and stress on syllables. And more exposure to the patterns in language is always a good thing for a young language learner. Rhyming itself has long been considered a pre-literacy skill, or a foundational skill that later reading skills are dependent on. Though it is no longer thought to be predictive of later reading success, it remains a valuable skill for children to learn. Being able to identify words that rhyme requires a child to be able to listen to, isolate, and compare the endings of words to decide if two words rhyme or not. In addition, writing a book with rhyming words often causes the author to use more diverse vocabulary. Consider the example from Llama Llama Red Pajama below. The word “fret” is included because it rhymes, and after reading this book as one of our favorites, my little ones have this uncommon word in their vocabularies. Cool! And finally, I love books that have repetition for toddlers. Repeated words and phrases in books provide more opportunities for kids to learn vocabulary, allowing kids to participate in reading the book once it has become familiar to them. It also helps encourage talking in young ones, since once they know the book well, the repeated phrases are easier opportunities to “read” the words along with their adult. So, for myself and even my older kids, I definitely prefer ebooks over physical ones. With e-books, you can have access instantly, check them out from the library, or buy them on Amazon. Plus with Amazon Households, we can share our Kindle ebooks which really comes in handy for my teens. But most importantly, with ebooks there is no paper used, no energy to produce the book. No waste, and that makes me happy! But, for toddlers, it is really important for them to have access to actual, physical books. In particular, sturdy board books that have cardboard pages. Board books have thick enough pages for little fingers to turn. Some important pre-emergent literacy skills do include page-turning, orienting a book correctly, and understanding that a book reads front to back, and left to right. All these things are learned by reading board books. 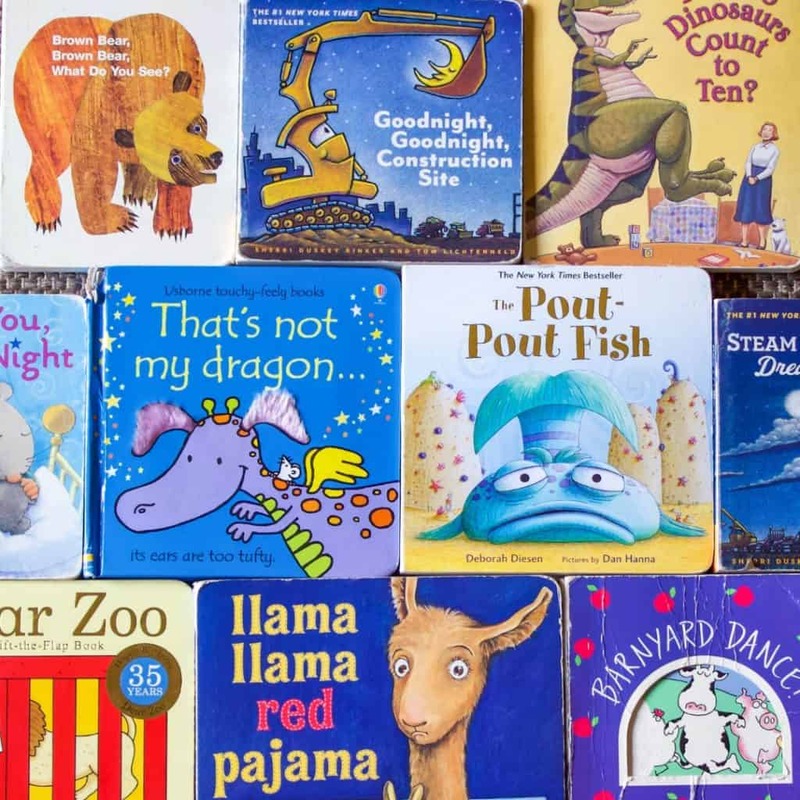 The books on my list of favorites for babies and toddlers below are pretty well-known books, so they are very likely to be at your local library if you want to try before you buy. But having books around all the time and reading them over and over is really beneficial to toddlers, so I would recommend investing in any of these books for your home library. We have all of them at our home and many more, but these 10 are my faves for rhyming, rhythm, and repetition! This adorable bedtime story has rhymes and repetition. “I love you like frogs love flies. I love you like pigs love pies.” Super cute. Short and sweet. This is just one in a whole series of touch and feel books. “That’s not my dragon…” is repeated on every page, along with great sensory descriptive words. “It’s tongue is too fuzzy.” We also have That’s Not My Fairy, which we also love. Touch and feel books are awesome for toddlers! This book incorporates all three “R”s! The self-proclaimed pout-pout fish goes around pouting and spreading “the dreary-wearies all over the place” until he discovers he was wrong about himself all along! It teaches a good lesson and is very fun to read! If you haven’t read any of the Llama, Llama books, start with this one! It’s such a cute (and relatable) story of little llama getting tucked in to bed by his mama llama. Lots of rhyming and rhythm in this one, and it’s also the perfect bedtime story. This incredibly imaginative story takes what is actually a child’s toy train and brings it to life, complete with animal crew members who are busy working the night shift! This book is beautifully illustrated and uses rich, rhyming vocabulary, making it one of my all-around personal favorites! This classic has lots of repetition, allowing little ones to join in. As a bonus, your child will learn color names and animal names when you read this to them! This counting book tells about a dinosaur finding various everyday items around his house. “Two big balloons tied to the bed, three toy trucks painted blue, green, and red.” Lots of rhyming, and opportunities to practice pointing and counting on each page! 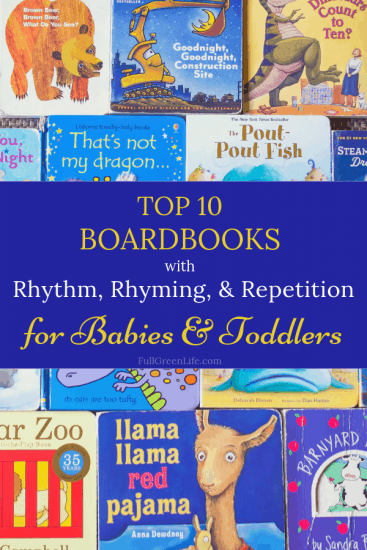 Whether you are looking for board books to add to your own home library, or you will be gifting books to a new baby, any of these books with rhythm, rhyming, and repetition are perfect choices!